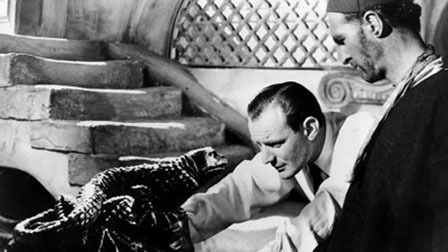 Trevor Howard, centre, discovers a statue of a salamander that Changes! His! Life! No, really! It is a dark and stormy night as archaeologist David Redfern (Trevor Howard) drives across Northern Africa in the 1950 adventure flick, The Golden Salamander. His mission is to retrieve some artifacts that have been stored in a cellar since World War II. But, on the way, Howard encounters a mud slide and discovers that a mysterious truck has been ditched. Upon closer inspection, he sees the truck is carrying a shipment of guns. Now, Howard is an academic who works for a British museum. He decides that a suspicious truck full of arms is none of his concern. Yet, when he rummages through the artifacts that he is to catalogue and ship to England, he finds a statue of a salamander – a stout, ugly creature made of pure gold with an inscription: “Not by ignoring evil does one overcome it, but by going to meet it.” Howard then decides to take all gun-related matters into his own hands. Howard is terrific, as he always is. He’s believable as a man who’s determined to get the job done, whether it’s packing up artifacts or telling locals they should not be running guns. Still, there is the one scene where Howard runs down a steep hill and we rather thought he moved like a girl. Not that there’s anything wrong with that. The big problem with The Golden Salamander is the stupid mistakes the characters make. Plot holes are one thing, but to write sloppy mistakes into the script to advance the story is another. For example, a character has a letter that will help him escape the gun-running biz and flee to France. This letter sticks enticingly out of a coat pocket that is left in a busy cafe. We ask you: If you were fleeing to Paris, would you treat such a letter this carelessly? We didn’t think so. However, there is a great supporting cast in this movie. Anouk Aimee is a young woman who lives and works at the Cafe des Amis that Howard frequents. Of course she falls in love with Howard, but there is one very satisfying scene where she screams at him to mind his own business and go back to England. As much as we like Howard and his character, we think this outburst was long overdue. Herbert Lom, best known for his work as Chief Inspector Dreyfus in The Pink Panther movies, is the stereotypical heavy that the movie needs. He’s a menacing character who is capable of anything. However, Lom isn’t given much work with in this script, and his character is so dense at times, you actually smack your forehead. The best character in this movie is the evil mastermind, played by Walter Rilla. Rilla is a smooth, cocktail-drinking, cigarette-smoking villain in pressed suits and groomed features. We are suspicious of him right from the start. After all, the artifacts were stored in his cellar all those years and he wasn’t curious enough to even look at them. Someone who is not tempted by the prospect of stealing such riches is either a saint, or already has a hefty illegal cash flow. We think you might enjoy The Golden Salamander if you don’t expect too much. The cast is worth it, as are the scenes of Tunisia. You just have to resolve to not analyze the plot. You’ll only drive yourself crazy. The Golden Salamander: starring Trevor Howard, Anouk Aimèe, Herbert Lom. Directed by Ronald Neame. Written by Lesley Storm, Victor Canning, Ronald Neame. The J. Arthur Rank Organisation, 1950, B&W, 93 mins. Try as I might, i just don’t recall anything about this movie. I do think I’d like it, though. It reminds me of the movies that used to fill the airwaves of broadcast television after midnight. How I miss those! Oh yeah – that is EXACTLY the kind of movie this is! After five whole seconds of thinking I have decided that I love Trevor Howard more than I dislike plot holes. I’ll have to check this one out. Thanks for another great review! Thanks, Paul. Trevor Howard is really very good in this movie – he makes the script seem better than it actually is. I can’t wait to see this movie. I am especially interested in Tunisia. The great news is this film is available on Netflix. I love it when good things comes easily. I too miss late, late night television….watching something engaging that’s not quite right while the world is dark and everyone else is asleep. Ah, yes, the late night television movies. I watched a lot of ’em back when I was a teen doing babysitting gigs… I think you’ll like the exterior scenes in this movie. The groom’s procession was really interesting; I had never seen one before. I’ve never heard of this one, but I have to see it. Thankfully, it’s on Netflix! Great post, as always 🙂 It’s such a fun read. Thanks! Thanks, Sarah. It’s not a film to clear your schedule for, but it would be perfect on a rainy/snowy afternoon or late at night. I really like that it’s an unusual time and place… so much so that I would watch it again. Gotcha. There’ll be a lot of those kind of afternoons and nights here shortly 🙂 It sounds so interesting! I rarely get to say this, but I have never seen this movie. I like Trevor and Anouk so, even with its limitations, I might give it a whirl one day when I have time to kill. Thanks for the review; it is good as always! I’m surprised to hear you say you’ve never seen this! Well, please let me know what you think if you do have the chance to watch it… Howard and Anouk are terrific together. 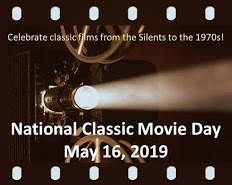 Ha, even I have not seen (or written about) every old movie out there! Still, it is nice to see an article about a movie I have only heard of and don’t have my usual knowledge about. I really enjoyed it, too! Seen it as of today! This evening my partner and I watched this movie. I meant to…and he couldn’t help but watch. It is very watchable. We had fun. The most delightful moment for me was when the livestock paraded through…well…not to wreck it for those that haven’t seen it. Also…I love the face of the piano player. Thanks for making me aware of this film. It was worth it. So glad you liked it! The piano player was a bit of a scene-stealer, I thought, and I wanted to write about him at length. But I’m determined to keep my posts under a certain # of words, so I left that gem for people to discover for themselves. Loved your ending warning viewers not to expect too much, and the dangers of over-analyzing. Suspension of disbelief — without it, it would be impossible to enjoy most movies! I really like Trevor Howard (runs like a girl, huh? I guess there’s nothing wrong with that if you ARE a girl). I’ve never seen this, but there seems to be enough good about it to give it a try. Thanks for the heads-up!